Kids, back in the summer of 2012, we had an Ikea hacked nightstand, RASTafari, and we made a new matching headboard from scratch that we named Doormir. Then Bill showed us how he made me a cup holder and mini nightstand. But we still had that mossy green comforter and lime sherbet dust ruffle. It wasn’t terrible, but it wasn’t ideal either. A Duvet would easily solve the problem. Trouble was, after scouring all the decor shops (West Elm/C&B/PB etc) we still hadn’t found anything that was just right. Not too girly or too manly, have some blue, maybe white, but be a color or pattern that wouldn’t show dirt too quickly either. Then, while enjoying an episode of How I Met Your Mother, I caught a glimpse of Lilly and Marshall’s bed linens. It was PERFECT! It had just enough of a pretty pattern, but wasn’t frilly in any way and had nice clean lines. If Marshall could sleep under it, so could Bill. So I went to the internet to see if I could figure out where it came from. It turns out, there were others with the same question, and sadly the duvet was a vintage Ikea textile you could no longer get in stores. Like many of Ted’s girl friends, it was just not meant to be. But that pattern down the middle reminded me of so many of the pretty lattice prints I’ve seen around and had been looking for a way to incorporate into our space. The easy fix would be to pick up a pair of flat sheets and make a giant pillow case, aka a duvet cover. Bill’s a proud Penn State Alumni, so I was thinking a royal blue and white, but toned down with some gray. I found a blue and white sheet set at PB Teen (no longer available) and after playing with a few summer sales and coupons, pulled the trigger and ordered the set. The plan was to use the flat sheet for the middle panel and the scrap for curtains or pillows, then use the fitted sheet and pillow cases as they were intended. Then I went to Target and found some soft gray sheets to piece it all together. Using the dimensions of another Ikea Duvet I have, I divided the dimensions in thirds, with the darker gray being the outside thirds and the middle third being made up of the middle pattern and a thinner stripe of lighter gray. You would figure sewing a bunch of straight lines would be simple. But not with a dinosaur sewing machine that likes to jam up at will. Sad to say, this project took nearly a month of nights after work to complete. But at least it didn’t take 8 seasons. Seriously? How on earth is Ted that oblivious? 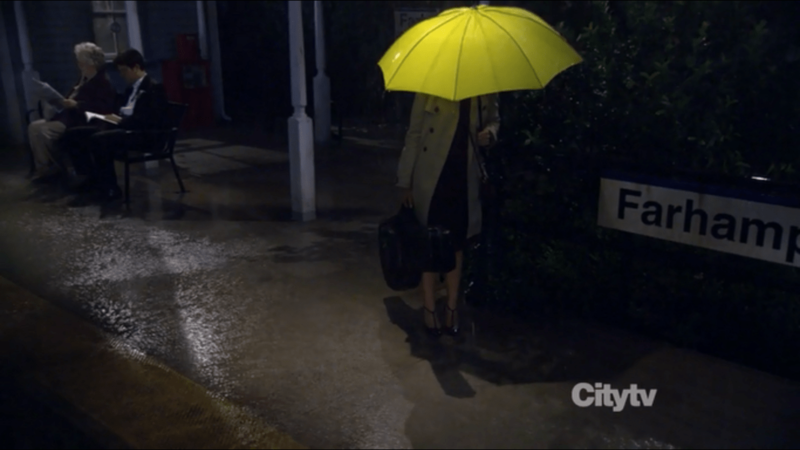 SHE’S CARRYING A YELLOW UMBRELLA? HELLOOO? Unlike the story of finding Ted’s wife, this reveal will be Wednesday. So check back to see how it all came together (and how I nearly lost it). Plus a bonus tutorial on Friday for DIY Flange pillow cases.